This sword is called, "The Blind Swordsman Zatoichi". It is half tang and stainless steel with a hamon. 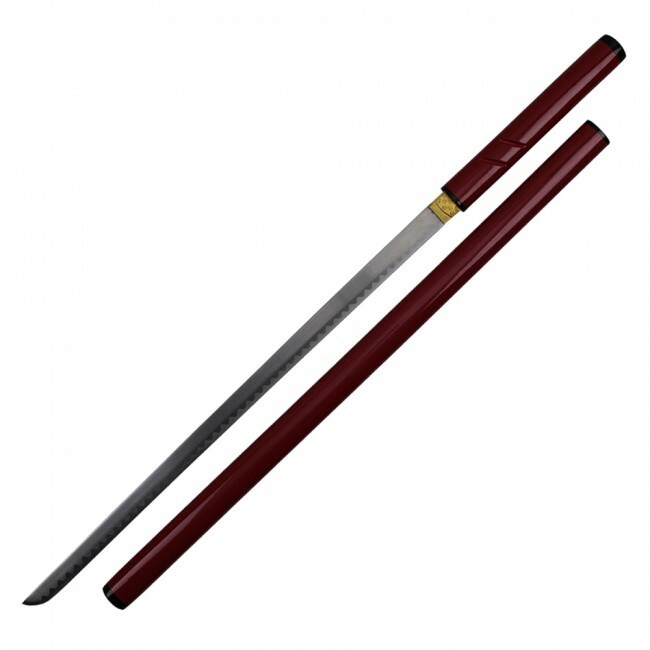 This is used by Zatoichi as a Shikomizue, which means cane sword. 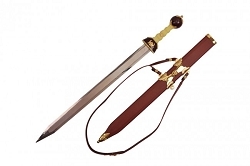 The saya (scabbard) is constructed of wood, painted red around the meeting of the saya and tsuka, and then lacquered. Zatoichi seems to be only a harmless blind anma (masseur) who wanders around the country making his living by gambling; however, he is also highly-skilled in swordsmanship, specifically iaijutsu. He does not carry a traditional katana, instead using a well-made shikomizue (cane sword). 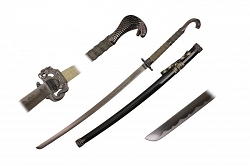 Shikomizue were generally straight lower-quality blades which could not compare with regular katanas, but as revealed in Zatoichi's Cane Sword, his weapon is nearly superior to one as it was forged by a master blade smith just before his prime. A recurring theme of both the films and television series is Zatoichi protecting the innocent from oppressive warring yakuza gangs, and general injustice. His fighting skill is incredible, even more so considering he grips the sword in an inverse manner; this combined with his sometimes inexplicably keen ear, nose and proprioception renders him a capable surprise attacker. He is also most likely ambidextrous.